Metal tubing is typically manufactured by roll-forming a strip of sheet metal, although it can also be extruded or drawn. 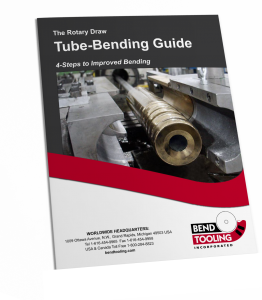 (Extruded and drawn tubing typically feature very heavy walls or complex cross-sections and are not frequently encountered in tube-bending.) Once manufactured metal tubing can be formed into a finished part by a variety of processes including flaring, swaging, beading, hydroforming, and, of course, bending.